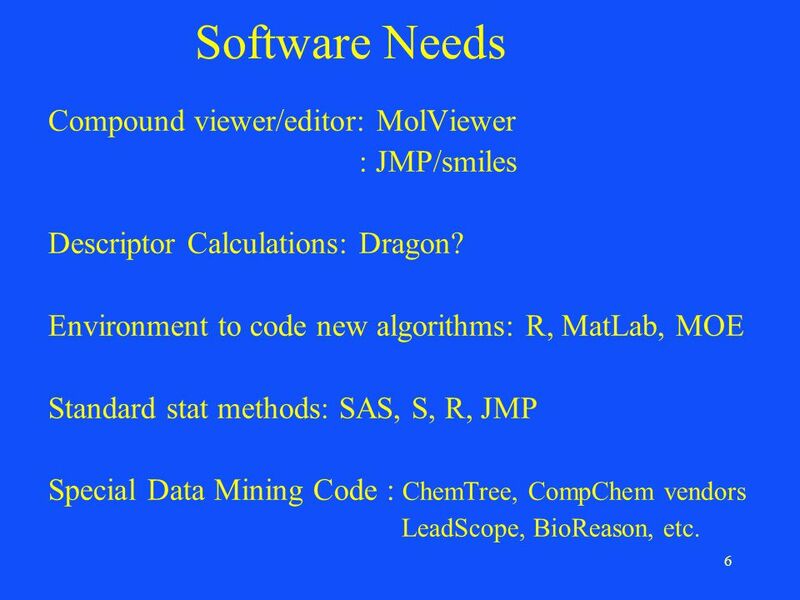 6 6 Software Needs Compound viewer/editor: MolViewer : JMP/smiles Descriptor Calculations: Dragon? 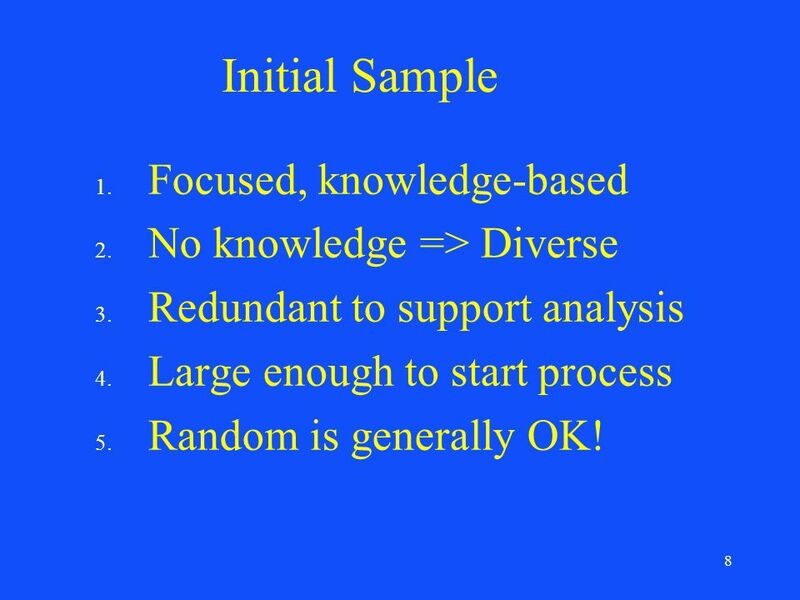 Environment to code new algorithms: R, MatLab, MOE Standard stat methods: SAS, S, R, JMP Special Data Mining Code : ChemTree, CompChem vendors LeadScope, BioReason, etc. 8 8 Initial Sample 1. Focused, knowledge-based 2. No knowledge => Diverse 3. Redundant to support analysis 4. Large enough to start process 5. Random is generally OK! 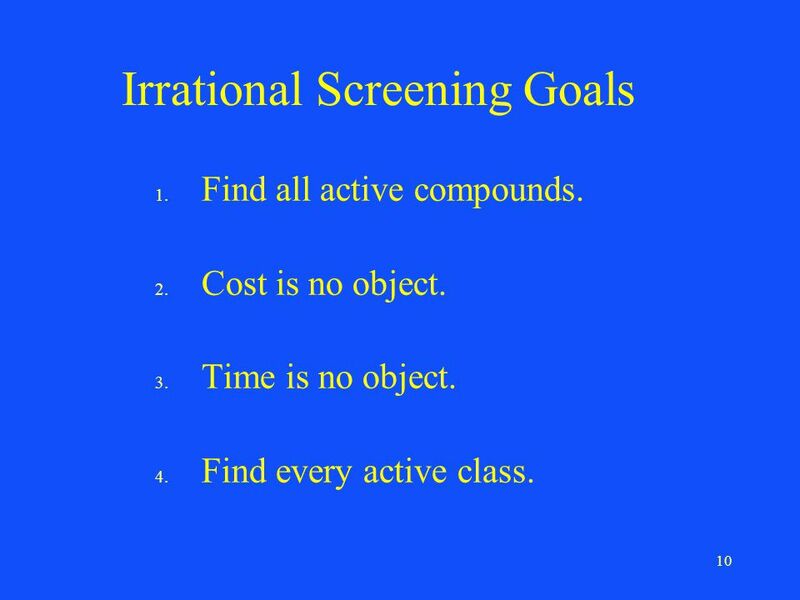 10 10 Irrational Screening Goals 1. 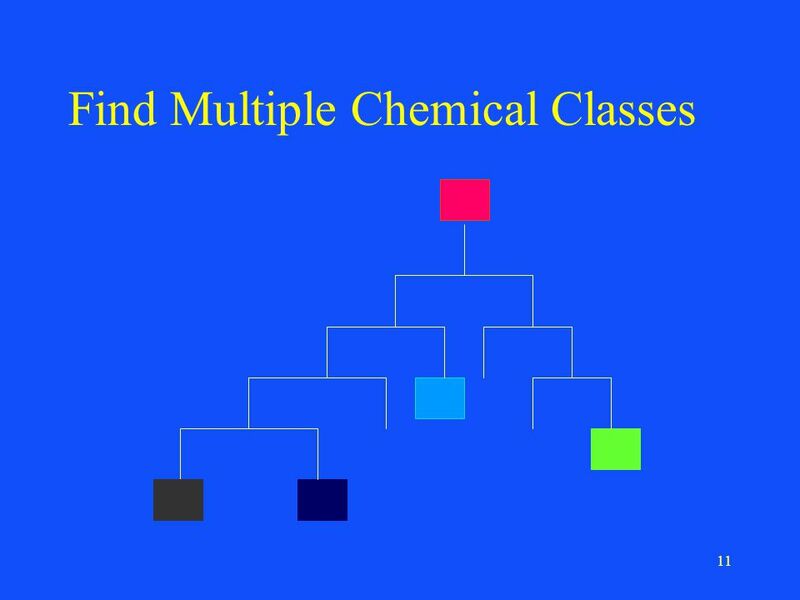 Find all active compounds. 2. Cost is no object. 3. Time is no object. 4. Find every active class. 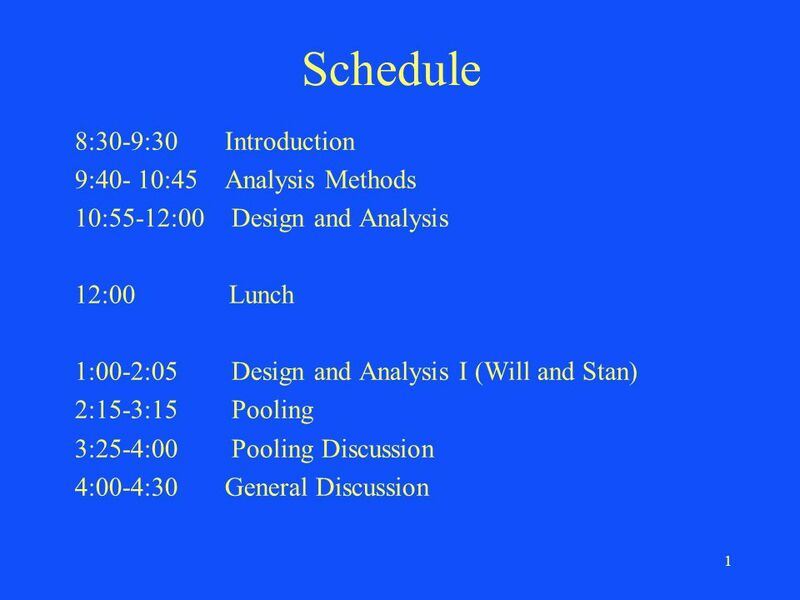 Download ppt "1 Schedule 8:30-9:30 Introduction 9:40- 10:45 Analysis Methods 10:55-12:00 Design and Analysis 12:00 Lunch 1:00-2:05 Design and Analysis I (Will and Stan)"
CONFIDENTIAL INFORMATION KnowTox, a Franco- Hungarian collaborative project relative to toxicity. 1 Real World Chemistry Virtual discovery for the real world Joe Mernagh 19 May 2005. Indiana University School of David Wild – CICC Quarterly Meeting, Jan Page 1 Projects 1-4 update David Wild CICC Quarterly Meeting January 27. 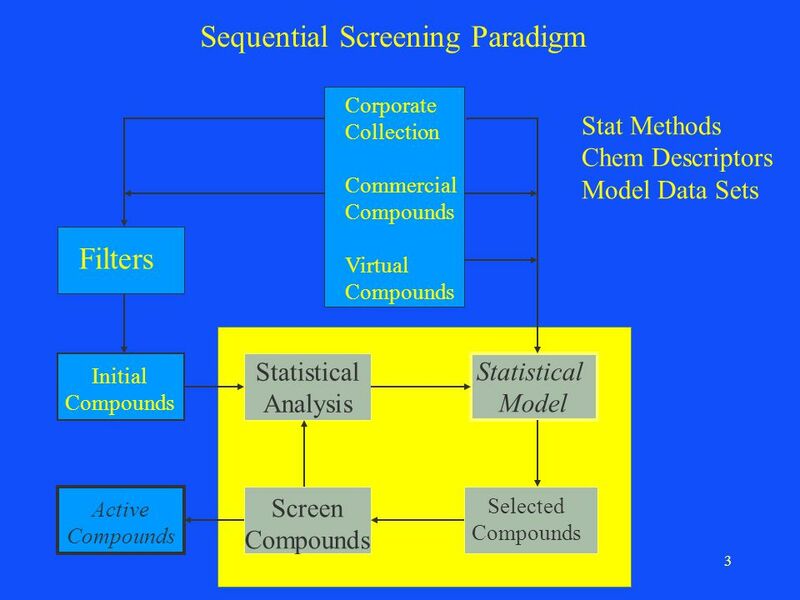 6th lecture Modern Methods in Drug Discovery WS10/11 1 More QSAR Problems: Which descriptors to use How to test/validate QSAR equations (continued from. 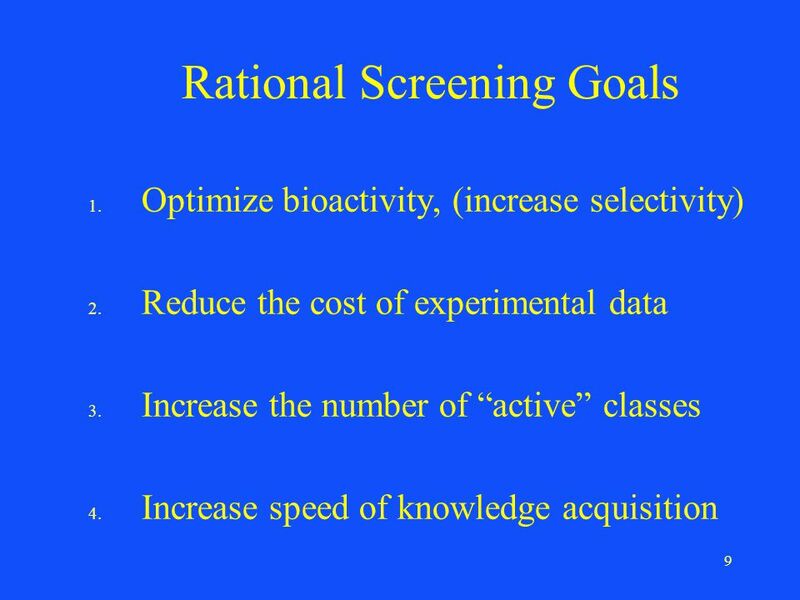 Analysis of High-Throughput Screening Data C371 Fall 2004. 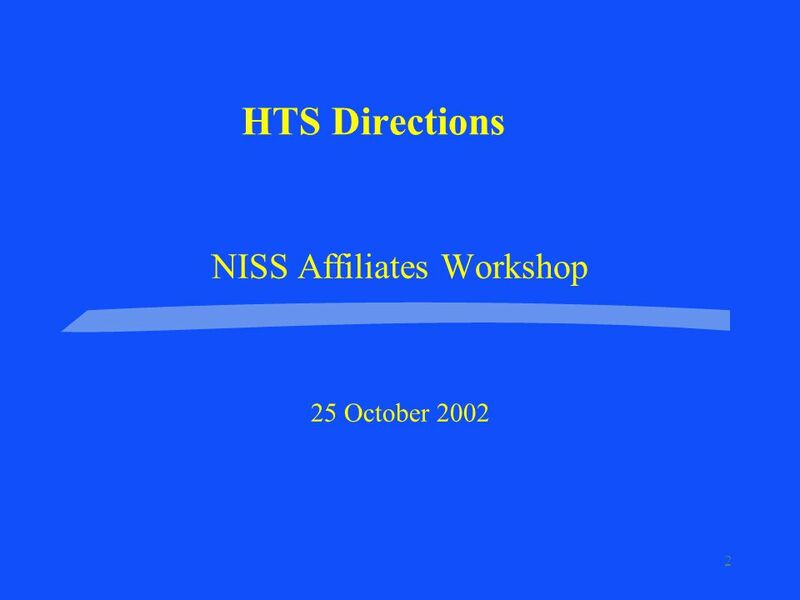 1 Sequential Screening S. Stanley Young NISS HTS Workshop October 25, 2002. 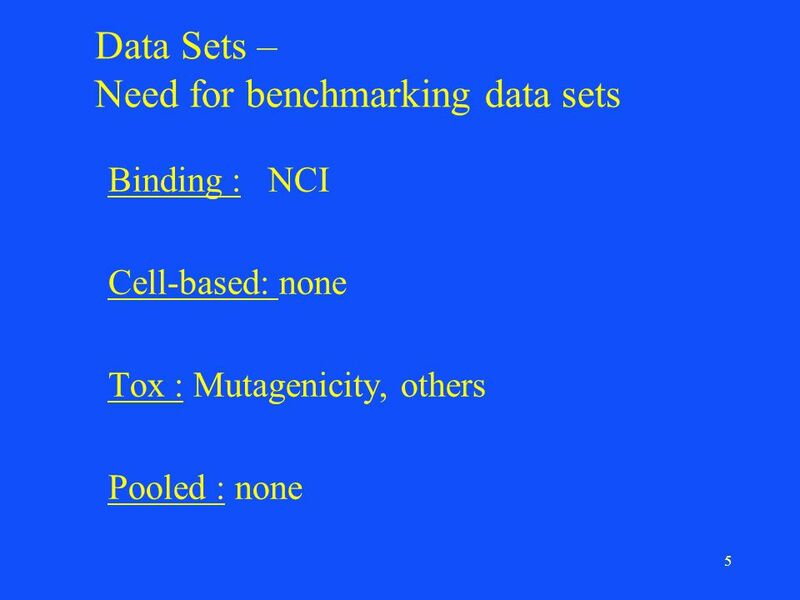 Linking Genetic Profiles to Biological Outcome Paul Fogel Consultant, Paris S. Stanley Young National Institute of Statistical Sciences NISS, NMF Workshop. Exact Logistic Regression Larry Cook. Outline Review the logistic regression model Explore an example where model assumptions fail –Brief algebraic interlude. 1 PharmID: A New Algorithm for Pharmacophore Identification Stan Young Jun Feng and Ashish Sanil NISSMPDM 3 June 2005. Faculty of Computer Science © 2006 CMPUT 605February 04, 2008 Novel Approaches for Small Bio-molecule Classification and Structural Similarity Search Karakoc. Cheminformatics II Apr 2010 Postgrad course on Comp Chem Noel M. O’Boyle. Jeffery Loo NLM Associate Fellow ’03 – ’05 chemicalinformaticsforlibraries. ABSTRACT Modern drug discovery process involves mapping pharmaceutical knowledge about target proteins and ligands as well as sophisticated computer science. 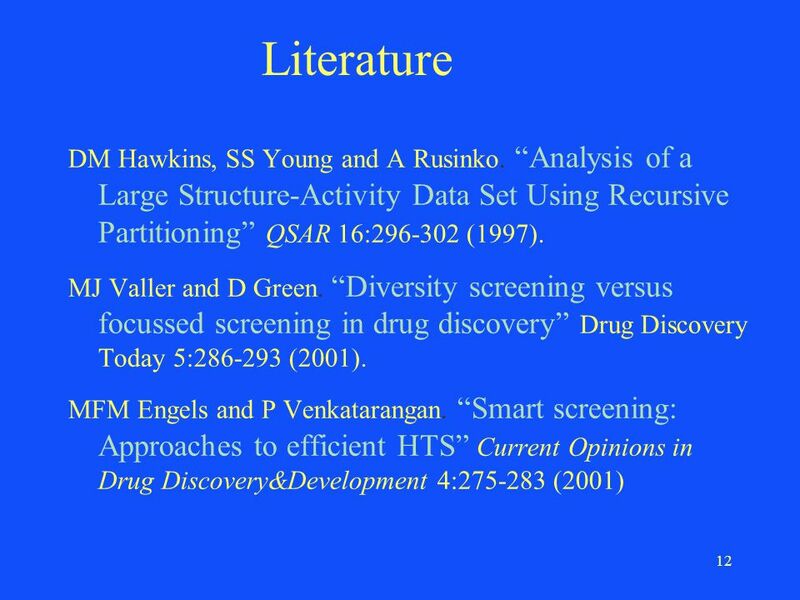 Active Learning Strategies for Drug Screening 1. Introduction At the intersection of drug discovery and experimental design, active learning algorithms. 1 BrainWave Biosolutions Limited Accelerating Life Science Research through Technology. 3. Chemical Data and Data Bases. 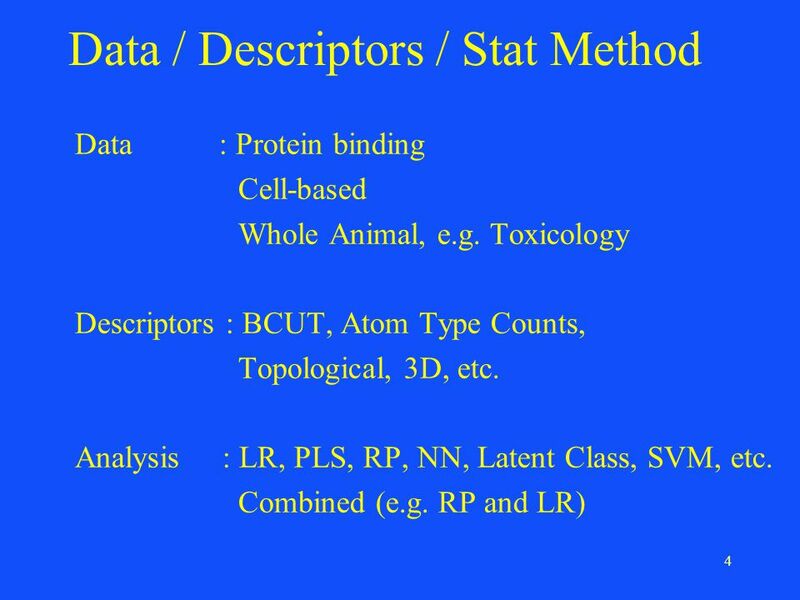 2 Datasets and Databases Many small datasets are available Several commercial databases of compounds and reactions (e.g. Chemoinformatics Harno Dwi Pranowo, Prof. Dr. Chemistry Department FMIPA UGM.